Cruising *our* style – Emerald Waterways, doing it right! Have you ever thought “I’d love the idea of going on a cruise…. But not with thousands of unknown people for weeks!” Or perhaps “I wish cruises visited some really INTERESTING places, not just seaside-touristy-destinations…”? My husband and I thought these very same things, and simply resigned ourselves to not cruising. But then….. during a trip visiting the some of the capitals of Europe….. we were searching for the striking Holocaust Memorial “The Shoes on the Danube Bank”. It involved a bus from our hotel, an extended walk to locate the promenade we wanted, and then, some detective work as to how to get around all the construction and actually across the busy road to the site. Aggravating but so worth the effort! Then, we spied a riverboat cruiser. I took photos thinking it was pretty neat looking. Now, we didn’t actually know what it was, just noticed people coming and going, simply stepping off the gangplank and strolling along the promenade. They looked happy and relaxed, about to embark on the adventures offered by this city….. and definitely not the way we had felt, struggling with luggage and unfamiliar train/subway stations. They stepped off their boat and were in the middle of all the action. No transfers, no taxis, no subways/trains/buses….. We thought “Wow – what a great way to see this city – and look at all that GLASS to look through! We should do that.” And promptly forgot all about that travel option in the efforts to get to the next capital. Fast forward to the next year’s vacation planning, and while looking over previous photos, we noticed the one with the riverboat cruiser. But these are brand-new riverboat cruisers. They are modern, sleek and offer up all sorts of creature comforts and conveniences for passengers. Try out a heated pool, a fully-retractable glass roof, pop-up bars, an interesting indoor/outdoor balcony experience and al fresco dining/movies. Wow! So, I began investigating costs, routes, different cruise lines, etc. 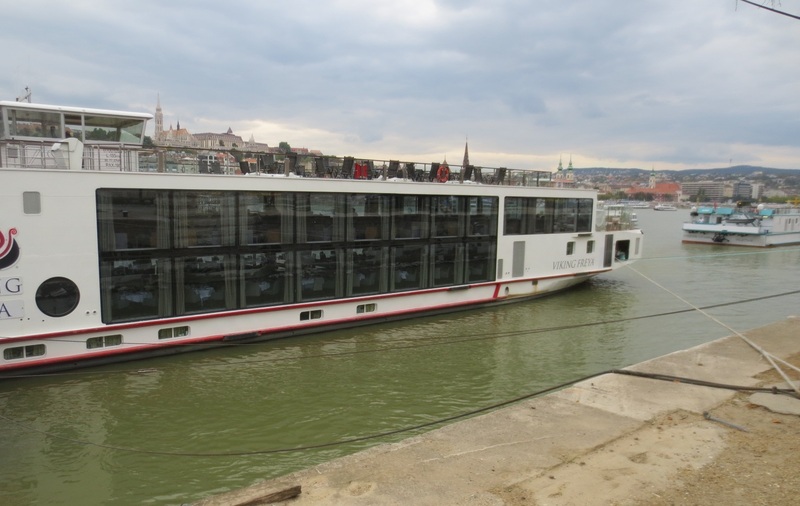 And one name kept popping up as a new entrant into the European river cruising world…. Emerald Waterways. Why consider Emerald Waterways? Look at what all is included…. All meals and tips. Free Wi-fi on board. All port/entry and transfer charges. Airfare from UK locations as well as others. Shore excursions and UNESCO World Heritage sites. Brand new ships. Wine, beer and soft drinks are included. And every stateroom has a river view! All included. No giant bill at the end of the cruise. Since we’d first seen the riverboats on the Danube, and wanted to go re-visit a number of things we’d yet to explore there, we began investigating that particular offer, the “8-day Danube Delights” cruise. More info is available here… and here’s a map of the stops – looks perfect for us as it includes a couple of our favorites, plus new stops! Now, we’re not fans of “forced” sightseeing. We’re not much for shepherded groups being rushed through museums and such. We like a bit of structure and some suggestions and information…. Not being led around by a leash. But this itinerary includes some walking tours, guided tours, sightseeing drives, UNESCO World Heritage sites, and something that’s *truly* different, an afternoon tea hosted by a local Slovakian family – now how fun and personal is that? Looks like there’s enough free time built into the schedule so we’ll be able to customize our adventure as we choose. Yeah, Emerald Waterways has won us over. They will be our choice for European River cruising and you’ll read all the details about our trip right here!